On the Failte Ireland Tourism Barometer, there is much positive evidence of growth in tourism numbers. As you would expect, the various metrics are changing. For example British visitor numbers are down, obviously due to Brexit and the drop in Sterling. But numbers from other countries – especially from the U.S. are up enough to compensate. Regardless of who they are and where they are coming from, tourists will always need transport. So whether it’s planes, trains, automobiles (self-drive), bicycles or buses… transport operators will have a key role to play. 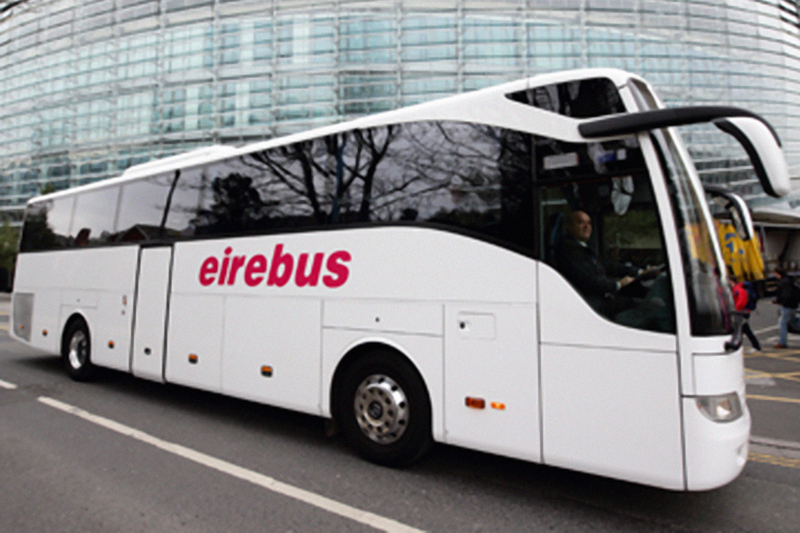 One of the biggest operators in Dublin is Eirebus, with a fleet of 65 quality coaches. Eirebus is family-owned business, co-founded in 1971 by the Kavanagh family as an off-shoot of the original Urlingford-based Bernard Kavanagh & Sons, which has been in operation since 1945. Until recently, Paddy Kavanagh was the Managaing Director of Eirebus. From packaging tours through their destination management division… to transporting visitors to all the hot spots in Ireland, Eirebus is at the coal-face of tourism in Ireland. They also provide coach hire for specialist groups such as golfers, wedding parties, and so on. But it doesn’t stop there. Looking at coaches sitting idle during winter time, Paddy was keen to ease the dependence on the summer tourism trade. He acquired the Swords Express service in 2011 and oversaw its expansion in the years that followed. This is a scheduled service that operates for 52 weeks of the year and has been added to recently with the Fingal Express. This was a sensible strategy. After all, the capital cost of buses is intensive and operators need to sweat those assets. And total dependance on tourism can be a risk, due to currency fluctuations, changing political landscape, ash-clouds etc. It can only be a good thing to de-risk your business where you can. Paddy’s daughter Sinead originally joined the business in 2003 and over the years she learned the ropes from the ground up. She has played a key role in defining and developing the company’s overall strategy. She since became shareholder and Marketing Director in 2009. Soon after, Sinead’s husband Jeff Clarke also joined the family business and quickly rose to the challenge of Transport Manager for the business, later assuming the role of Operations Director. Planning for succession is a priority for all family businesses. There are two aspects to that. One is the ownership issue which involves legal and taxation matters. The other often overlooked issue is the management of the business, i.e. who will do what, when and how… how should the heritage be protected… and how should the legacy be carried on. This typically raises all sorts of questions around best fit, competence, skills, wishes and countless other important matters. Good sense should always ensure that best fit dominates over any sense of entitlement or birthright. With the best will in the world, the intention was for Sinead to take over the running of the business in an orderly fashion over time. But sadly, Paddy passed away suddenly in September. Unfortunately, that didn’t allow time for the planned handover. Sinead is not only having to deal with the personal loss of her father, but she is also faced with the immediate task of taking over a very successful business. In cases like this, the immediate priorities are to ensure that the business continues to trade effectively, until such time as the initial grieving has eased. Most companies will have a great team to step up to the mark, as the Eirebus team did. For the past 12 weeks, it has been business as usual. As the business continues to operate under the guidance of Sinead and Jeff, there are some major things to be done. The following is not necessarily a sequential list as every company is different. But they are certainly early priorities. Quickly get a handle on money matters. Make sure you understand a number of things about the finances. You don’t have to be an accountant to understand where the money is coming from and where it is going. Seek advice either from your accountant or banker. Make sure you know and understand the key drivers which you will extract from monthly profit and loss accounts… cash-flows… and the balance sheet. Get to know every person on your team, starting at the management level. Start with general meetings to reassure everyone of your intentions. Follow up then with one-to-one meetings to get to know each person better and listen to their concerns. Establish who does what and when. Don’t rush to make changes (if you make any at all) as it’s probably best to maintain the status quo for the time being. Using the 80:20 rule, establish who your key customers are. 80% of your sales will most likely come from approximately 20% of your customers. Make contact with the most important ones (whether that is by size or level of influence) to reassure them and listen to their concerns. Move quickly to illustrate that you are on top of things. Be seen to make your mark by taking corrective actions on any problem areas. As with customers, use the 80:20 rule to better undertand your most and least profitable products and services. Take time to understand why they are so and what tactics had been employed in the past. There may be good reasons for the mix as it is so don’t make snap decisions. All of this will take time, especially as you yourself go through your own personal journey. When you feel that you are ready, consider bringing an external mentor on board for a period of time. This temporary role is to guide you through a facilitated and structured planning process – with you and the top team. This will give you an opportunity to take time out in an objective way to craft a strategy and an action plan for the next couple of years. Working with family companies of all sizes, I know that succession is challenging, whether it is carefully planned or imposed through life events. This particular situation is exceptional due to the suddennes of it. The steps might well be different in other situations. I’ll discuss them over time. Nevertheless, new leaders inevitably bring change and new ideas. With empathy and good communications, everyone in time will accept that.